I’m done stressing and obsessing over food, ARE YOU? As a mom, I understand the struggles of taking care of your children while ALSO trying to take care of yourself. Especially when it comes to our eating habits and health. Here’s the thing, I often hear from moms who I help how they tried getting their “eating habits together” by going on a new diet. However, the end result is deprivation, food guilt, food anxiety, and overeating – especially if you are a Jewish mom like me where Shabbos comes around every weekend and despite your best intentions it ends up being a binge fest with you frustrated as ever. Sound familiar? I’ve been there, and let me tell you it’s not you – its the diet! In fact, research has shown that 95% of diets fail and 66% of people gain back more weight than they lost. I want to show you how you don’t need diets (and the stress it comes with) to live a healthy and happy life! I help Jewish moms like me ditch the diet and heal their relationship with food because I GET IT! I struggled with yo-yo dieting for over 15 years. I tried every diet in the book and all it did was make me feel food obsessed, restricted, and like a failure every time I couldn’t stick to the ‘plan’. Dieting would chip away at my self-worth. I’d feel ashamed and guilty for “breaking” and binging, and go straight back to dieting. Then repeat the cycle. Listen, we have enough mom guilt to deal with. We don’t need food guilt on top of that! Ain’t nobody got time for that! And besides, there is nothing healthy about feeling guilty over what you ate. I was able to break free of this unhealthy dieting cycle and unhealthy eating habits when I learned about Intuitive Eating. 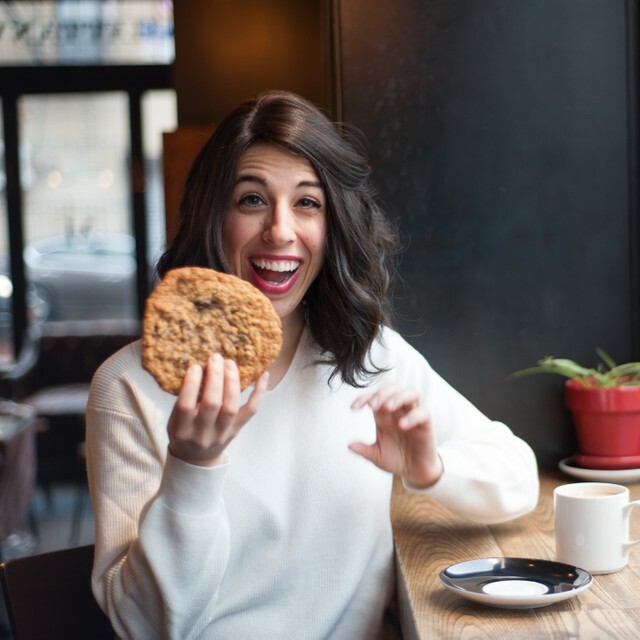 Intuitive Eating teaches you to reclaim the innate skills you were born with, which is to regulate your eating by connecting and trusting your internal cues from a place of self care and awareness. It teaches you how to honor your health AND taste buds – without restriction, deprivation or food rules. Food is no longer a struggle for me and I now teach other Jewish moms how to live this way, too. Are You Ready to Ditch the Diet? Take the Quiz to find out! Food becomes peaceful and healthy eating is simple when you learn what drives your eating habits and understand how to listen to your body. As moms, simple is what we need! Amiright?! Moms have enough worries on their minds, food does not and should not have to be one of them! I can now take all the energy and brain space where stressful food thoughts once were and use it to be more present with my family & friends and get my daily to-do list done without food being a burden. I can now enjoy the shabbos meal, not worry what will be served at the Bar Mitzvah, and leave a restaurant feeling satisfied instead of bloated. I trust myself and my body – it is truly freeing and I want you to feel this way, too! If you tried every diet in the book, if you are tired of obsessing over food, if you want the scale to stop ruling your life, if you want to foster a positive body image, if you are done feeling guilty and stressed over what to eat and how much – you are in the right place! Living a healthy and happy life shouldn’t be difficult. If you are ready to make peace with food and nourish yourself with joy and confidence, click here to learn how my 3 month Signature Coaching Program can help you achieve that life! Thanks for being here! You can do this, girl! You were born with the power to nourish yourself – it is time to reclaim it for the healthy and happy life you deserve! In health & happiness, Rachel. Rachel Goodman is a holistic Registered Dietitian Nutritionist and Jewish mom of 2. Rachel understands the challenges of juggling a busy life and taking care of yourself, which is why she believes health begins with a healthy relationship with food, fostering a positive body image, and making time for self-care – all of which are imperative for mental, physical, and emotional health. Rachel holds a degree in Health & Nutrition Sciences and completed her dietetic internship at New York Presbyterian Hospital. With experience in hospital, long-term care, and one-on-one nutrition coaching, Rachel uses her knowledge and skills, together with her whole-person approach, to help clients heal their relationship with food and their body, and live a healthy life from a place of peace, joy, and trust. Rachel resides in Brooklyn, NY and conducts private sessions virtually via zoom.